Connected™ is an alternative monthly giving platform to direct debit. The system uses SMS text messaging to communicate with donors and RG PSMS (Regular Giving Premium Short Message Service) donations to take monthly payments. Find out if we can help you organisation with regular mobile giving payments by calling our team of friendly experts on 0845 08 29622. Many UK charities are putting a mobile response in the forefront of new acquisition and regular giving strategies. 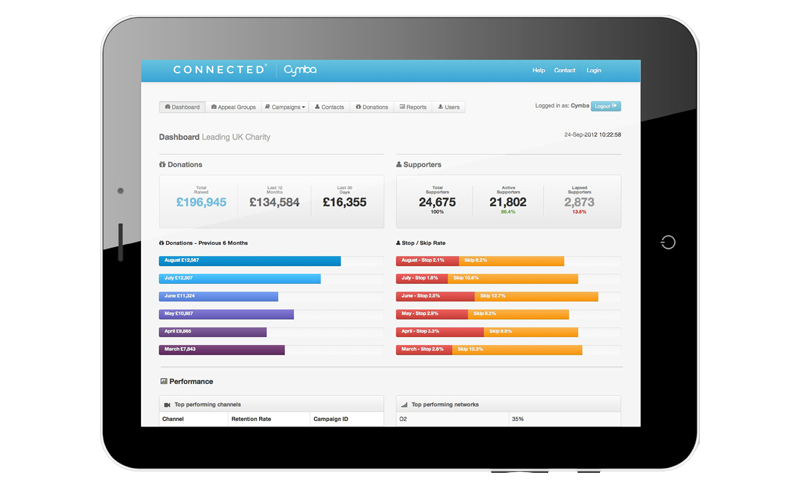 Cymba’s integrated multi-channel approach includes DRTV, print media, face-to-face, facebook, other social media and telephone fundraising. Our systems work with all leading media and fundraising agencies. We understand how mobile fundraising metrics work - from response, data security, compliance and ROI perspective. Customers include UNICEF, WSPA, WWF, Christian Aid, NSPCC, Marie Curie Cancer Care and Sense. As mobile giving adoption continues to spread throughout the third sector, it will drive digital fundraisings growth even further because you can donate and share information with anyone at anytime from anywhere.